Check out these fascinating sessions planned by alums from ASH New Orleans! As Sacred Heart educators, we believe in programs demonstrating academic rigor, grounded in faith, that will educate the whole child. 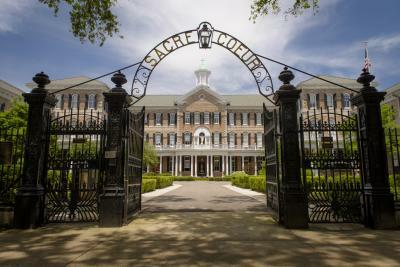 In a world where technology is growing at an ever-quickening pace and, we are increasingly a more connected, global community, Sacred Heart schools are uniquely positioned to leverage our network and deep roots to provide forward thinking, innovative education for our students. Please join us as we host rotating sessions highlighting ways in which the Rosary has incorporated curriculum that will be crucial for ensuring our students' success in this rapidly changing world. Global Education | Globalization makes it evermore important for our students to form global connections and experiences. Through exchange, international partnerships, and exposure through programs, global education is being integrated throughout all divisions. Financial Literacy | Through a partnership with local coffee shop, PJ's, we developed an experiential financial literacy program where Upper School students run a coffee shop on our campus. H20 for Life | Middle School students integrate entrepreneurship and social awareness which impels to action into their curriculum through this financial literacy program. Students are responsible for developing a business plan, creating a product, and making the sale - all for a good cause. An illustrated lecture on New World beginnings and the growth of Sacred Heart traditions in the Mississippi Valley.